The starting point for being able to do this is for all involved to UNDERSTAND terms, legislation, impacts or principles that apply to biodiversity conservation, sustainable utilisation and the sector involved – in this case forestry. It is also about understanding why biodiversity mainstreaming into forestry needs to be done. Commercial afforestation in South Africa is dominated by species of Pinus, Eucalyptus and Acacia (wattle). These fast growing species are grown in high rainfall regions along the eastern escarpment. The high runoff catchments in the provinces of Mpumalanga, KwaZulu-Natal and the Eastern Cape are well suited for plantation forestry. The trees are mainly used for pulp and sawlog production (Godsmark 2014). The forestry industry contributes about 1.2% of South Africa’s Gross Domestic Product (GCIS, 2012). It is a net exporter of forest products, and the value of forestry exports in 2010 was R13.4 billion (GCIS, 2012). Approximately 80% of plantations in South Africa are managed by large companies with the balance under the control of private farmers and communities (FSA data). Community ownership is growing with South Africa’s land reform programme. Small community-based plantations provide an income to rural households. In 2011, approximately 62 700 people were directly employed within the forestry sector, with 103 200 indirectly employed and providing a livelihood for 652 000 dependents (Godsmark, 2012). 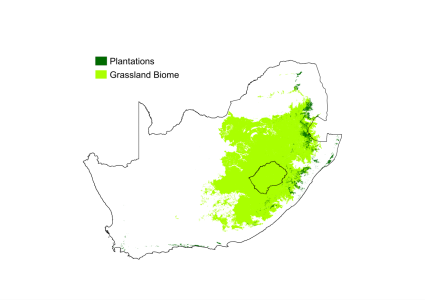 Most of the plantations in South Africa are located in the Grassland Biome (check the inserted map. Source: SANBI (2009)), where forestry is the second largest land use. Most of these trees are planted in high rainfall areas with moderately deep soils that are naturally species rich. This has resulted in a substantial reduction in the moist grassland vegetation types have been replaced by plantations. Plantations also affect rivers, wetlands, and their associated ecosystem processes through their high water usage. GCIS (2012) South African Yearbook 2011/2012. Government Communication and Information System, Pretoria. Godsmark, M. 2014. The South African Forestry Industry’s Perspective on Forestry and Forest Products Statistics. Presentation to FAO Workshop on Forest Products Statistics, 27th November 2014. The legal case for biodiversity in plantation forestry? As a signatory to the Convention on Biological Diversity, South Africa has an obligation to conserve biodiversity. Recognising the importance and uniqueness of South Africa s biodiversity, legislation surrounding biodiversity is extensive and well developed. Government regulation of the forestry industry is robust in the form of the National Water Act 36 of 1998 and the National Forest Act 84 of 1998. The National Water Act declared plantation forestry as a declared stream-flow reduction activity, which requires a water use licence. Some water stressed catchments had been closed for further plantations due to these regulations. The National Forest Act provides protection for indigenous natural forests.